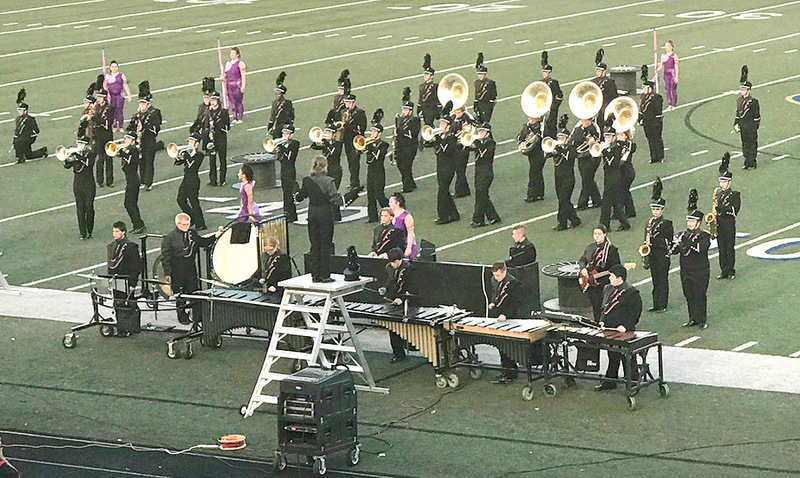 Despite a huge crowd, stifling heat, and high humidity a cooperative effort between Oologah Paramedics, Oologah-Talala Schools and other agencies kept health impacts to a minimum from Saturday’s Oologah Marching Band Contest. Kelly Deal, OTEMS director, said the success of the effort highlights the paramedic ambulance service’s value to the community and the importance of advance planning among multiple agencies—something OTEMS stresses. “This proactive approach was deeply rooted in providing critical access care at the scene rather than being reactive,” Deal said. The huge annual event this year drew more than 20 marching bands from Kansas and Oklahoma and a large crowd on a day when the temperature hit 92 degrees—11 degrees above normal—and the Heat Index exceeded 100 degrees based on preliminary National Weather Service Data. “OTEMS, because of our commitment to the community, was able to provide this valuable service. “First and foremost we want to applaud the efforts from the school and particularly the Stallion Battalion band director Jon Matthews for recognizing the need to be proactive in preventing heat related illness for the participants and spectators that attended this event,” said Ryan Setzkorn, assistant director of the Advanced Life Support ambulance officially known as the Oologah-Talala Emergency Medical Services District (OTEMS). “In 2016, we responded to 5 medical calls and had to call mutual aid for another 4 patients,” he said. “This year because of the planning and resources put into effect we only had to transport one patient for heat related illness. The school estimated that this year there were approximately 2,500 attendees, which includes spectators and participants. This year there was increased efforts to remind attendees to be aware of the symptoms of heat illness. Schools were asked to not wear their full uniforms while practicing and even told that no points would be deducted from their scores if they chose not to wear the uniform while playing on the football field, Setzkorn said. Mustang Stadium has artificial turf, which increases the impact of high heat or heat indices. “Several announcements were made to remind people to drink plenty of fluids and to notify them where our First Aid center was set up. “We had meetings with the school prior to the event to create an Incident Action Plan (IAP) for the day of the event,” Setzkorn said. Dave Davis, a regional coordinator for emergency medical services, created the IAP as well as the medical command post that included response planning with other agencies which besides OTEMS included the Northeast Oklahoma 911 center, Rogers County Emergency Management and the Northwest Rogers County Fire District. Davis is not only an OTEMS paramedic but also is the coordinator for the Region 2 Emergency Medical Service System, the organization that the state can activate to respond to disasters nationwide. “We want to thank Dr. Jack Lamberson, our medical director, for his support of OTEMS and his willingness to allow OTEMS to go and provide services that include preventative medicine, and proactive response. “Even with this planned response we were able to provide regular 911 services to our area. By having this planned out, we were able to avoid a mass casualty situation that would have otherwise overwhelmed the standard 911 system. “This was not just a standard First Aid station but a full service Advanced Life Support-capable critical care access point for participants. It was mentioned while we were there about how well the EMS system worked behind the scene and did not create a sense of emergency to other spectators,” Setzkorn said. Northwest, which often assists at medical calls, did not have to respond to the school for any of the day’s events. In addition, OTEMS did not to need mutual aid from any other ambulance service despite handling both the huge event and a normal number of routine medical calls during the day.